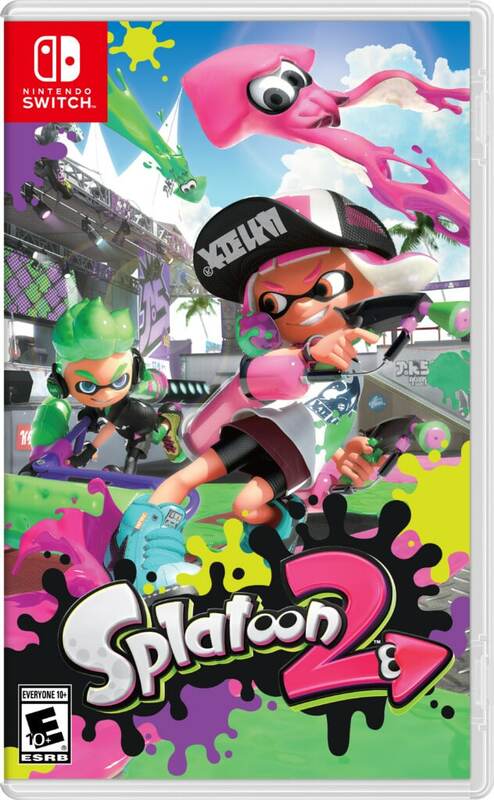 The follow up to the hit 2014 game, Splatoon, Splatoon 2 is upon us. I am here today to review that game. The gameplay of Splatoon 2 is very simple, you move around and shoot ink but if you turn into your squid form, you can move around faster in your ink and recover ink faster. There are 7 different classes of weapons in the game right now with the brella class coming soon in a free update. The shooters are the average gun with average fire speed, damage and range. 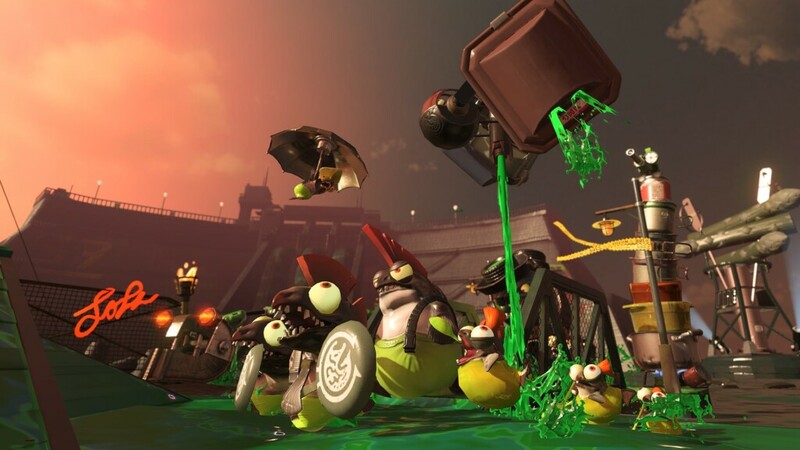 The rollers leaving a trail of ink behind you, killing or splatting, as the game calls it, anyone you make contact with and can fling some ink forward. The chargers are a sniper that has to be charged up before use. The blasters which fire a large glob of ink into the air that explodes shortly after. 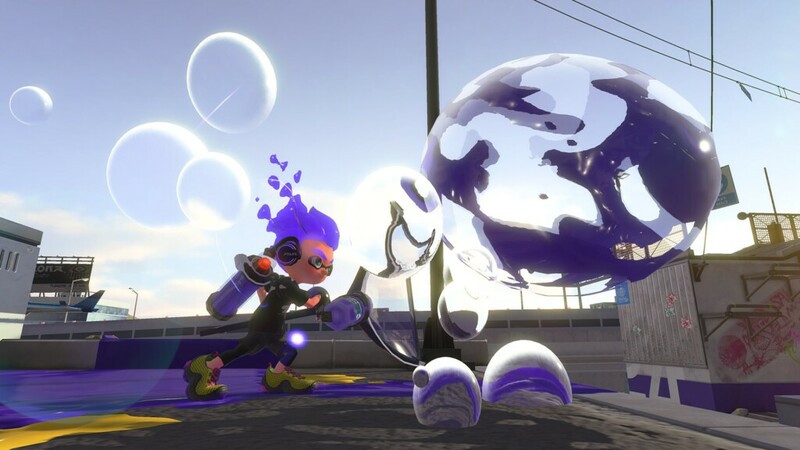 The sloshers throw a bunch of ink into the air that can be used to shoot over walls. 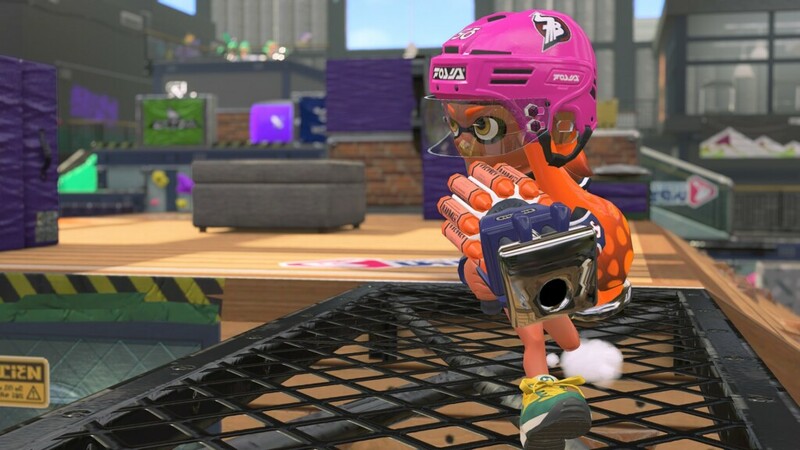 New for Splatoon 2 are the dualies which are a rapid fire dual wielding weapon that allows the player to perform a dodge roll while shooting. The main mode in this game is the online multiplayer. At first you can only play regular matches which consists of only Turf Wars. 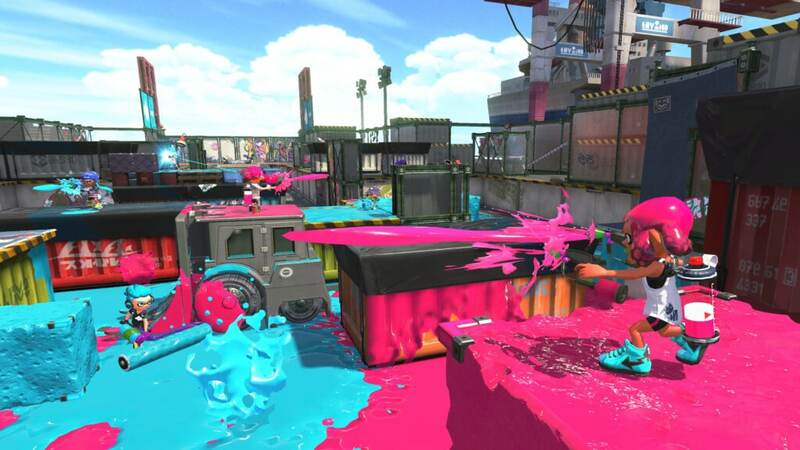 In Turf Wars you and three other teammates must compete to ink the most area with your color ink. Chargers are very ineffective because getting kills is not the primary objective and it inks turf very slowly. After every match, you gain experience points based on how well you performed in the match. Once you reach level 10, you gain access to Ranked Battles which consist of 3 different more competitive game modes that rotate every 4 hours: Splat Zones, Tower Control and Rainmaker. Splat Zones is a King of the Hill style game mode where each team tries to take control of a central zone by covering it in ink. When a team has control of the zone their timer starts counting down from 99. Whichever team’s timer reaches 0 first wins. In Tower Control, you must capture a tower that is in the center of the map, when a player is on top of it, it moves towards their “goal spot” that is near their base. If the tower is in your “goal spot” you win. In Rainmaker you must grab The Rainmaker from the middle of the map and make your way the the goal in the opponent’s base. 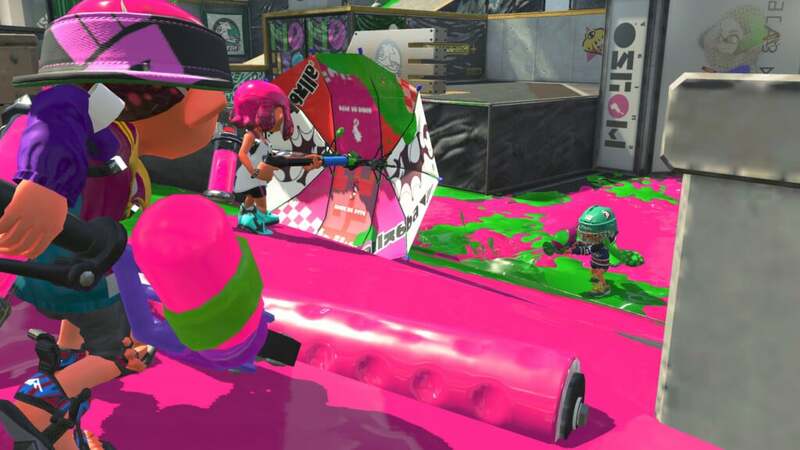 The Rainmaker is a weapon that allows the user to shoot a ball of ink. When The Rainmaker is brought to the goal that team wins. I do not have much experience with these modes as I am not skilled enough to reach level 10. There are 7 stages in the game but at any given time there are only two available with them rotating out every 4 hours. I do not see any benefit to this except that if there is a stage that you like you can play it more often but I would rather have all stages available at once to have variation. The single player campaign consists of you trying to save the Great Zapfish from the evil clutches of the evil Octarians. Unlike the first game where you had to use the default Hero Shot the whole way through, you can unlock other types of weapons such as rollers or chargers by playing certain levels. This game mode is very fun and offers a nice challenge and change of pace from the online multiplayer. This game will also receive free updates of more weapons and stages just like the first game so look forward to fresh new content coming soon. Splatoon 2 is a very fun game with enough differences to make it unique from the first game and have its own identity. We Didn't Win the Super Bowl, But We Still Vacationed in Disney World! This splatoon 2 game looks like fun. Looks like the 2nd version is just as much fun as the first. This will be on my son’s wish list for sure. This looks like a lot of fun! It seems like the style of game that my son enjoys playing!